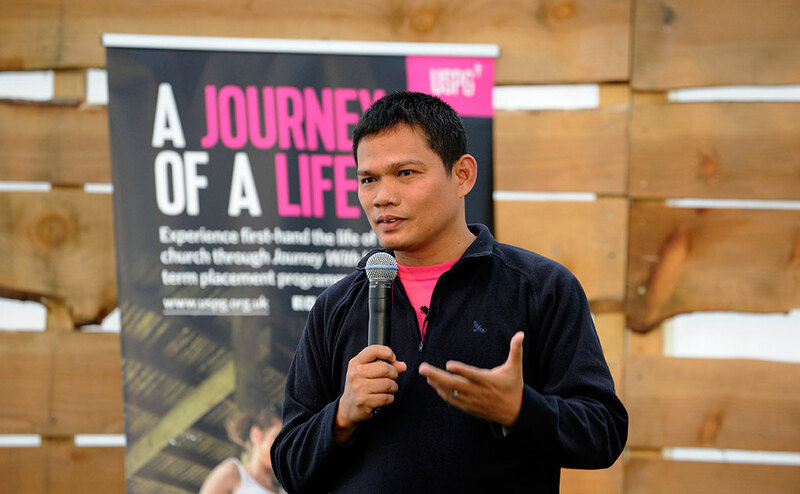 Greenbelt 2018 speaker and peace activist, Rev. Christopher Ablon has recently been included in a list of Filipino priests and human right defenders who have been ‘red tagged’ (declared an enemy of the Duterte government). The list was released in February of this year. Those who are ‘red-tagged’ often end up either being murdered or declared guilty of trumped-up charges and put in prison. “YOU CALL ME A TERRORIST. “You, AFP (Armed Forces of Philippines) call me a terrorist. I am certainly not a terrorist. And that is easy to see. What is common between me and the bishops, lawyers & journalists who are in this virtual hit-list are the following: we Work for the advancement of people’s rights. THIS IS NOT TERRORISM. In our Church, we call this our mission and ministry. We provide sanctuary for the lumads (indigenous peoples in Mindanao) and advocate for their right to self-determination. THIS IS NOT TERRORISM. In our Church, we call this mission & ministry. We call for the resumption of the peace talks towards lasting peace based on justice. THIS IS NOT TERRORISM. In our Church, we call this our mission and ministry. You called me a terrorist. No I am certainly not. I am a missionary and minister. You, AFP (Armed Forces of Philippines) call me communist. Unfortunately, I am not. I have not yet obeyed the commandment of Jesus Christ to ‘sell your possessions and give money to the poor’ (cf Matthew 19:21 NRSV.) I do not belong to a community who ‘All who believed were together and had all things in common; they would sell their possessions and goods and distribute the proceeds to all, as any had need’ (cf Acts 2:44-45 NRSV.) So if an examination will be conducted to test whether I am a communist, I will surely not pass. You call me a communist. No I am not. I can only wish I am. I am a Christian. If that is the reason that you call me a communist, I thank you! USPG invite Greenbelters to join them in praying for Father Chris, the IFI church and all of the other people who have been targeted by the AFP. You can also send a message of support to Father Chris and the IFI church by emailing Emma at USPG or following USPG on Twitter and Facebook.